The Shebang in Luang Prabang! If you’re up at the crack of dawn, you can catch the town’s most extraordinary sight. 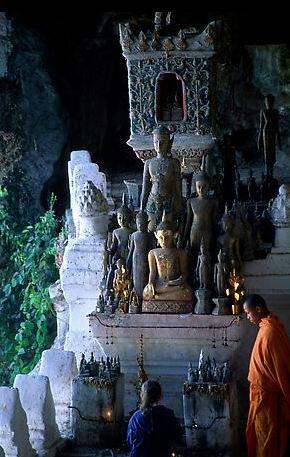 Scores of saffron-robed monks (some as young as ten) file out of the monasteries and make their way barefoot through the streets, bearing gold-topped wooden alms bowls. 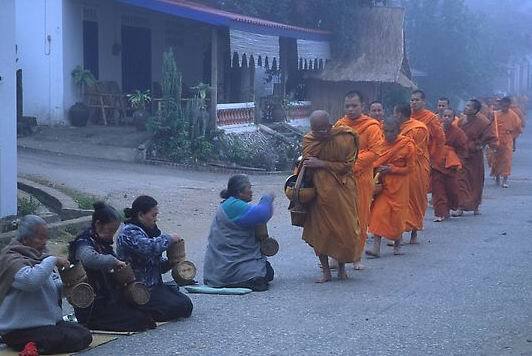 Along the route, locals wait to present sticky rice and other food to the monks, thereby earning merit by performing this good deed. Theravadan Buddhism dictates that women cannot stand higher than monks, so women kneel on bamboo mats to present food, while local men stand. As a mark of respect, women wear a traditional shawl, while men drape one shoulder with a white scarf. The long line of monks creates a swirl of orange, accentuated by the soft morning light; the scene is framed by russet monastery roofs, tall palm trees, and whitewashed colonial housing. 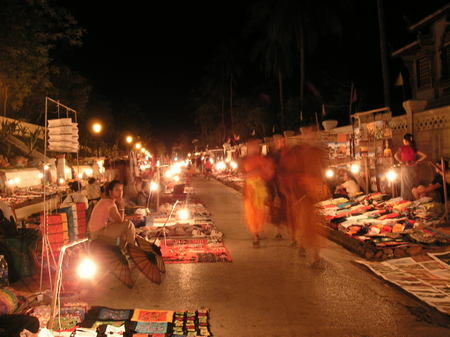 Within an hour, the monks complete their rounds, melt back into the monasteries and the streets become quite ordinary again. There are also loads of Laos massage places so you can kick back and have a treatment all day for about USD$25. You can rent a bike for USD$1 / day and go for a pushy around the town. There's tons of temples and interesting things to check out and explore. Alternatively you can hire a boat and go up (or down) the Mekong River and see the sights. There are the Pak Au Caves not too far away (see below), amazing waterfalls and you can even visit elephants and tigers.